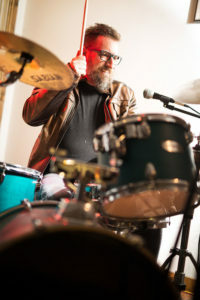 New Drummer Frank Puzzillo Joins First Round Band! FIRST ROUND WELCOMES OUR NEW DRUMMER! 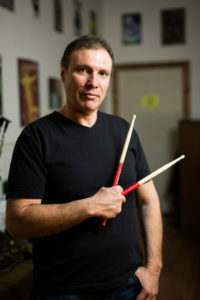 This upcoming weekend there will be a passing of drumsticks as we present the debut of our new drummer, Frank Puzzillo. Frank’s familiar face can be traced back to many successful years banging skins for the local band, Replica. By joining First Round, Frank is also reunited with his bass-playing partner in the pocket, John Pellet. John was the bass player for Replica during their long run as one of the most popular cover acts in the Hudson Valley. We’re glad to have Frank on board so please wish him well as our new drummer. Frank P’s debut will be this upcoming weekend at Whiskey Ally’s in Newburgh on Saturday, March 25th at 9:30pm. Come on down and have a celebratory drink with him and First Round. We will be performing around 70+ of your favorite kickass danceable rock songs. Sadly, that means we are saying goodbye to our current drummer, Frank Sardella. Frank S. has been our backbeat extraordinaire and good friend for many years now. Most of all, he is one of the primary reasons for our bands’ success in created our non-stop medley style of setlist arrangement. Frank will be turning his focus toward his business career so we wish him all the best in his new and future endeavors. He will always be a part of First Round. Thankfully, he will work as our fill-in drummer when our new Frank is unable to make it! Frank S. will be performing with us THIS Friday, March 24th at LaFamigila. Hope to see our Putnam County fans come out and rock with us. Our Orange County friends should consider the ride is only about 20 minutes from Newburgh. You will be rewarded with the amazing Italian cuisine at LaFamiglia! Then you will rock the night away with First Round until the wee hours of the morning. Thanks to everyone for your support over the years. We look forward to rocking with you in 2017 and beyond!